Burberry released the first photos of their fall/winter 2012 campaign. According to Burberry's Chief Creative Officer Christopher Bailey it's a play of everything that's at the heart of the Burberry world - celebrating the brand and London through imagery, film, music, weather and their iconic outerwear, all in a very poetic and British way. 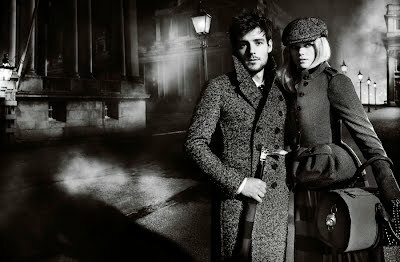 London is the backdrop for the cinematic, emotive black and white images and short films with the incredibly talented Gabriella Wilde and Roo Panes, who bring the campaign and collections to life across all Burberry platforms.